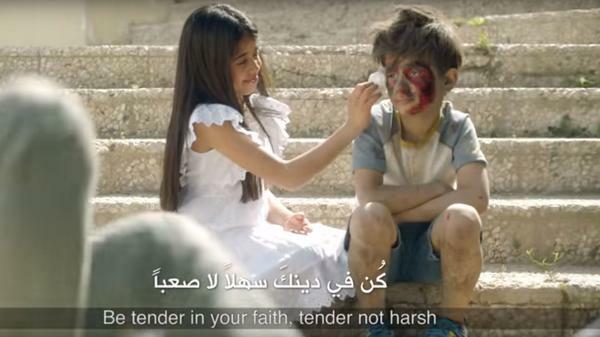 A new video for the Ramadan holiday has a message of peace — but its depiction of a boy who survived an airstrike in Syria is drawing criticism. With lines like "Let's bomb hatred with love," a Kuwaiti company's new holiday video is earning praise for urging peace in an era of terrorism. But the music video is also being criticized for portraying a famous young victim of airstrikes in Syria alongside survivors of ISIS bomb attacks. Released at the start of the Ramadan holiday, the three-minute video portrays a would-be suicide bomber as he moves toward an attack, and the Arab community that tries to dissuade him. It's an advertisement for Zain, a telecommunications firm that says it does business in eight Middle Eastern and North African countries. Interspersing scenes of the bomber's preparations with clips of people going about their lives — children playing, adults planning a wedding — the video mixes footage from recent devastating attacks with scenes of actual survivors and potential victims confronting the would-be bomber. The video's narrative turns on a duet featuring the phrase "Allahu Akbar" — Allah is greater — completing that idea with lines like "... than those who obey without contemplation." Singer Hussain Al-Jassmi of the United Arab Emirates then leads the community's message, offering the dissuaded bomber his hand and singing, "Let's bomb violence with mercy; Let's bomb delusion with the truth; Let's bomb hatred with love." The video has found a receptive audience: It's been viewed more than 3 million times and received more than 56,000 positive ratings on YouTube. Some of the real-life victims who participated in making the holiday video are identified on-screen as having survived the deadly 2015 bombing of Kuwait's Imam Al-Sadiq mosque, for instance, or a 2005 attack on a wedding in Amman, Jordan. But amid the acclaim, there are concerns about conflating attacks by extremist groups ISIS and Al Qaeda with Syria's civil war. That's because one of the victims is portrayed as Syria's Omran Daqneesh, who was 5 when a photo of him, sitting bloodied and covered in dust in the back of an ambulance, sparked widespread concern and sympathy last August. The photo put a human face on the intense fight over Aleppo. And now there are concerns that by evoking it, Zain and Joy Productions, which made the video, are distorting the truth about Syrian President Bashar Assad's regime. NPR has sought comment from Zain and Joy; neither had replied before this story was published. Accusing Zain of misusing the boy's image, some critics are also calling for the company to pull the video. "Zakaria Nassani, a Dubai-based news producer, went a step further, demanding that the commercial be removed. 'Omran, like thousands of children, is a victim of Assad terror and not ISIS,' he wrote, using 'ISIS' as another name for the terror group Daesh. 'We demand that Zain... remove your ad.' "
"Prominent Syrian activists Hadi Abdallah and Lina Shamy criticized the video for 'indirectly acquitting Assad of crimes' and 'forgetting that Omran's pain and the pain of thousands of Syrian children was not caused by someone in an explosive belt but someone who wears a suit and tie and sits in a palace.'" But not everyone has been as critical. Tahaab Rais, an advertising executive from the U.A.E., said on Facebook that Zain had made "a brave statement" by "taking on an issue that's affecting everyone's lives in this region (and around the world). Respect for taking this topic on." Replying to a critic who said it was misleading not to note the Syrian distinction, Rais wrote, "Execution is definitely not perfect. Broader message and pov is worth respecting!"